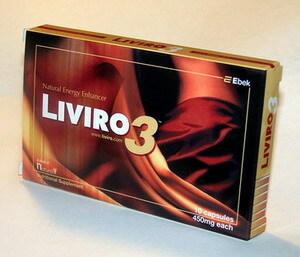 Liviro3 is a dietary supplement produced by Ebek, Inc. If you use it, stop now and read this. Report headaches and flushing to your doctor. The FDA found that a counterfeit version of this product contains tadalafil (Cialis), a drug used to treat erectile dysfunction (impotence). Risks are greatest in people taking prescriptions for diabetes, high blood pressure, high cholesterol, or heart disease because those prescriptions often contain nitrates that may interact with tadalafil and lower blood pressure to dangerous levels. While the genuine supplement states “Manufactured by Ebek Laboratory” on the front, lower left corner of the label, the counterfeit project label reads “A brand of Natural V”. This entry was posted on Wednesday, February 21st, 2007 at 9:25 AM	and is filed under Consumer Alert, Erectile Dysfunction, FDA/FTC/CDC. You can follow any responses to this entry through the RSS 2.0 feed. You can leave a response, or trackback from your own site.